The emergency property tax was introduced in late 2011 as a temporary measure designed to fill a large fiscal gap and appease an increasingly exasperated troika. PASOK leader Evangelos Venizelos was finance minister at the time and his announcement of the tax, levied via electricity bills, left him with a political stigma that is unlikely to rub off before his political career ends. It was the moment when the PASOK government lost the tacit support of much of the middle class, which hoped the austerity measures were a price worth paying for the reforms that came with them. Pounded by two years of wage cuts and tax hikes, many lost their faith in the government and the consolidation program. An argument could be made that the tax is more progressive than a lot of the other measures adopted by the government since it is calculated based on the size of each property. But the decision to levy it via electricity bills and the threat that those who did not pay would have their power cut off defined it as socially unjust. The threat of power cuts in cases of nonpayment was later withdrawn but the damage was already done and the government is now involved in a legal battle over whether electricity bills should be used at all to collect taxes. The government’s plan was to incorporate the emergency levy with other property taxes this year but the collection mechanism has not been deemed reliable enough yet to take on this task and ensure the revenues roll in. The emergency tax brings in about 1.7 billion euros a year and the troika has made it clear that unless this revenue can be reliably secured from elsewhere, the levy will have to remain in place. There seems to be some logic in the lenders’ request until one takes into account the fact that 1.3 million Public Power Corporation customers (firms and individuals) have not paid their electricity bills. At the end of 2011, PPC had arranged payment plans with 400,000 of its customers. This figure has now almost doubled. About 30,000 customers a month are having their power cut off – not because of the property tax but because they cannot pay for the electricity itself. This suggests that finding the best method to collect the emergency property tax is the least of the problems facing the government and its lenders. Finding Greeks who are still able to pay it is likely to prove a much bigger challenge. It’s a similar case when it comes to one of the other issues on the agenda for talks this week: deciding on how many installments to allow for individuals and businesses to pay off their debts to the state. Over the last few weeks, Greece and the troika have reportedly been at odds over how many installments taxpayers should be allowed. The government favors a maximum of 48 monthly tranches in order to lighten the load as much as possible but Greece’s lenders don’t think this is viable and prefer 36. The argument, though, seems to be academic when one looks at the reality of what is happening with overdue taxes. In the first two months of this year, the amount owed to the state increased by 1.3 billion euros to a total of 56.6 billion. 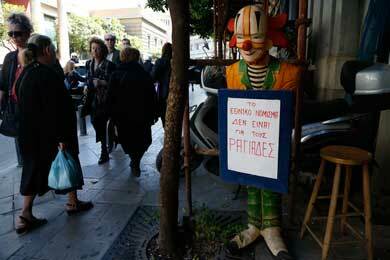 During January and February, just 488 million euros was collected from expired debts. It is clear that in an economy that has been shrinking rapidly since late 2008, the stark reality is that the amount of money owed to the state is increasing and no matter how much the government tinkers with payment plans, the 2.5 million individuals and 150,000 firms that owe taxes are not magically going to possess the ability to pay off their debts. Of course, every effort should be made to improve the collection mechanism and ensure that those who can pay are not allowed to hide behind the wider problems in the economy. However, to expect to squeeze fiscal blood from Greece’s petrified economy seems ludicrous. The declining VAT revenues at the beginning of this year are further proof of this impossibility. Yet, despite all this, the next few days will be taken up by discussions about how to levy the emergency property tax and how many installments to offer taxpayers for debts to the state. Surging unemployment, declining manufacturing and the deepening recession are unlikely to feature on the agenda. Perhaps this shouldn’t bewilder us anymore; the only real surprise is that the talks weren’t scheduled for April 1. This entry was posted in Economy, Greece and tagged Austerity, EU, euro, Greece, Greek bailout, Greek crisis, Greek economy, Greek manufaturing, Greek property tax, Greek taxes, Greek unemployment, IMF, Troika. Bookmark the permalink. On the comments sector of this article in today’s edition of Kathimerini English, an idiot has printed my facebook info. I would very much appreciate it if this comment could be removed as I am concerned over identity theft. There has been a great deal of personal info bandied around over the past two or three weeks and insulting comments,which are best ignored, but I do think that this is going too far. Thanks a lot Nick, it really seems very weird as many of us don’t even hide our identities and it is spoiling discussions . if you don’t feel fine with the time delay until work is done or don’t wish that any other people can spy out you that way, you should change the privacy protection level on facebook so that only friends can see your comments and pictures, but no strangers. Thanks Roger I have done that now but of course late in the day. I honestly didn’t think I was that important lol, am just one of the majority suffering here and refusing to lay down and play dead lol. Thank you Roger, I too will do this. My Facebook info has been used by ‘Pheovos’ blogging on Kathimerini English, to invent a whole lot of scurrilous lies about me and several Facebook friends of mine. Identity theft I have heard of but it is a possibility I had not considered at the time. I did expect that the leader of the obscenities would rise to the bait once my name was revealed, and Wow! he sure did. I’m avoiding any comment on Ekathimerini for the time being, but i will check out this article there. I notice that remarks can be removed by the original blogger. I wonder if EKathimerini or Disqus keeps records. And the information which I put in about ‘Dean Plassaras’, alias also ‘Phoevos’ was something I copied from a website and pasted, without alteration or addition. So authentic. Nick, I would like to hear how this situation, involving so much abusive blogging was able to evolve, unhindered? Thank you Annie and Roger also. MUN? Not sure? I have two grandsons, one is now at Drama School in Athens and the other has just been offered a place at Essex University. About Facebook, i’m a bit too trusting, so thank you. Annie, MUN, I googled and found Model United Nations as one definition. the other was rather confusing, concerned with character acting or something like that. OK, my eldest grandson, the theatre enthusiast, does try to spread his ideas around, has written and directed etc… My youngest was selected for the Junior Vouli in 2012, which was a great opportunity to talk, make new friends and contacts and he made a speech on the subject of education and was interviewed on TV. Our children and grandchildren will be the ones to preserve the integrity of Greek culture and will restore the respect which has been eroded in recent years. Another good article, Nick. It is a pity that the comments are overshadowed by problems concerning other commenters, but this is not to diminish their importance. If only the April Fool’s economy could be confined to one day (or one month), but alas the structural element implies a decade or more of incompetent Greek political decisions and adverse Troika policies. Guest may feel unconcerned, but when some of the participants of this blog discover that the way to silence their opinions is by exposing them, and shaming them, it is more than a pity, it is a disgrace. I am not unconcerned and have suffered from malicious trolls before, which is why I am anonymous. Here, I do not know who is a troll and who is a real person. An excellent definition of the problem. Here is my reaction to it. Yes Xenos, “the structural element” is the underlying problem, exacerbated by “Troika politics” and indeed “incompetent Greek political decisions” have not improved the situation.one iota. I take it that ,in your considered opinion, the structural element by now should have undergone some reform or at least modification, in order to effect a modicum of improvement in Greece’s dire economic and social situation. We lose sight of these necessary improvements when faced with the aspersions and insults against those of us who disagree with certain intransigent elements with unresolved personal agendas. My hope is that we can stop the tendency to raise, ‘ad infinitum’ (or should that be ‘ad nauseam’? ), the same points, which we all understand, and get down to serious thought with the welfare and future of Greece in mind, rather than tolerating the vendettas and vindictive attacks by people who suffer certain failures of mind and manners. Rosemary: for me, the problem (in a nutshell) is as follows. (1) The Troika is concerned with the viability of northern European banks and the integrity of advanced capitalism. Greece and others are an irritation. (2) The Troika “solutions” consist of austerity measures to cut expenditure and (theoretically) raise state revenues, as an immediate cut on the cost of financing the Greek and others’ budgetary deficits. However, the economists know that this is short-term nonsense: so, they impose neoclassical reforms (free market and privatisation crap) as the long-term structural solutions. (3) These long term measures have never worked anywhere, and there is not a cat’s chance in Hell that they will do Greece any good. The problem for the IMF is that they have no other ideas. (4) The Greek politicians’ solutions to everything always used to be: spend, spend and spend. This had to end with a eurozone monetary policy, but they were too thick to work it out. Now they know it, they don’t have a solution either. (5) So, in reality, neither the Troika nor the Greek state have a serious long-term plan for structural reforms. Some of the ideas of the Troika’s economists know in general terms what is needed, but they have no practical ideas for their implementation and no political support anyway. (6) The current Greek government has a deluded idea that “everything will work out in the end” so they just need to keep on bluffing and talking crap. Look at the opinion polls: Samaras is doing well, despite being a moron who has achieved nothing. (7) The bottom line is this: either Greece learns how to produce and market sellable quality goods (including tourism) and compete in the global economy, or it will fall into the abyss of Third World Economy. We are a quarter of the way there already. No other country is going to save Greece; the EU cannot provide inspiration and direction for Greece; the Germans cannot subsidise production and sales. This innovation has to come from the Greek people — from the intelligentsia (who don’t deserve the word) and the political idiots. I don’t see much hope, with the partial exception of Tsipras and a few others. Yet, they are disparaged (in the typical foolish Greek way) along the lines of his age, lack of family prestige, educational profile, anti-left political rhetoric…. in other words, Greeks continue to make the same mistakes as they have made since 1832. I agree with your analysis Xenos. I would simply add four things. (1) There seems to be a consensus among the Greek government, the Troika as well as part of the general public not only that austerity must be linked to reforms but also that the word “reform” must rhyme exclusively with downsizing. In my opinion, as well as that of many economists, insisting on radical downsizing a depressed economy ends up sending it (already has sent it in fact) into a deadly depressionary spiral from which it cannot emerge – a vicious spiral that will, ultimately, bring about a total collapse of the overall Greek society. I believe reforms must be uncoupled from the politics of austerity if we are to avoid this collapse. (2) There seems to have been a sustained campaign orchestrated to portray the bailout as some sort of free gift Northern Europeans are somehow being forced to give to their Southern neighbors. It should be stressed that these are in fact LOANS that will eventually have to be (are already being) paid back. (3) There has been a constant disinformation campaign waged by both the Troika as well as by part of our political and business establishment that there is no other solutions but to abide unconditionally to every diktat that some bureaucrat in Brussels dreams up for us. We are not supposed to try to negotiate (that’s the first pledge Samaras ditched after he got elected). This has now being going on for three years. During that time, our Northern European neighbors have had the time to reduce the exposure of their banks and financial institutions to the Greek debt and start to ringfence the remaining debt as much as possible. The end result is that their pronouncement that there is no alternative is fast becoming a self-fulfilling prophecy. Any negotiating position Greece might have had in 2010 is rapidly eroding away and soon Greece will have no alternative (and we may have already reached that point) but to accept the unacceptable even if they decide that the cost is too high. (4) It’s just incomprehensible to me how some people continue to prefer to trust people and parties that are DIRECTLY responsible for the mess we are in (ND and PASOK both) rather than give a chance to someone new (Tsipras). And in doing so, they use the same old stale arguments that have been used since the 1930s in Greece to denigrate anyone who might pose a threat to the established order of doing things. But, as you say in your post, ideology and dogma will unfortunately trump critical judgement every time in this hard and bitter nation of ours. Xenos and Greek Boy, thank you both. I’m taking time to re-read your accounts. Xenos, your item 6, final assessment, is well within my own ideas. Am i correct in remembering that one of your fields of expertise is in employment matters? Here we have a major problem in Greece. 1). Briefly, as we all know, that unemployment is damaging and probably increasing..
2). Then we have a system which has resulted in far too many salaried workers in the Civil Service resulting in many under-employed persons in public service jobs. 3). The ‘spend, spend’ problem includes payment to these useless extras. The abuses of power which they have developed are known. They are taxed of course, but again I use the word ‘extras’, which are not taxed..
5). Greece must undergo a massive revival, in terms of “can do” rather than the usual “it can’t be done”. We need to get rid of stupidity and negative thinking and actions. Big problem. Enshrined in the 1974 Constitution, which can always be quoted “It would be un-constitutional” both on a National level and in local attempts to modernise. 6). Greece has so much potential; Greece has so much room for development in many ‘areas’ of the economy; Greeks must be brought to accept the need for new ideas and an ethical approach in everyday transactions. On a personal level it is wrong to advance one’s own interests at the expense of fellow citizens and the country. 7). There needs to be a clear understanding that ‘we’ have been lied to by politicians: We have suspected them, but have voted for them irrespective, on the basis that there has been no alternative. This has to be remedied because with the ‘old guard’, abuses would continue ‘statu quo’, as before.. Mistake, Xenos, i mean item 7, your final assessment. Yes, you are correct in your recollection. I agree with your additional comments (and those of “anothergreekboy” who is — from linguistic style — Dean). In my comments I have tried to confine myself to structural big things, and leave the details out. In that sense, employment — despite being a major and very serious issue — is one of the details omitted. The past practice in Greece has been to create employment in the state sector and finance it partly through deferred loans (bond issues), partly through printing money and accepting high inflation, and partly through taxing the private sector. This should have ended with the eurozone, but actually the government access to cheap credit (on the basis of Germany underwriting the euro) exacerbated that and other problems. In the immediate term, my view is that the benefits of sacking the useless civil servants is highly negative: so again we are faced with the problem of short-term strategy and long term structural malfunction. The obvious answer is that the Troika should finance the short-term costs of sacking civil servants (in a fair evaluation of demerit) so that Greece can make a long-term strategy. By this, I mean the dismissed people need to be paid something for them and their families to live on, and probably should not be allowed to remain in the labour market. The macro-effect of their reduced income should be financed so as not to further impact on aggregate demand; job creation in the private sectorm, through company start-up subsidy. This, Samaras has indicated will happen: my fear is that there will be no evaluation of new business plans, and they will just hand out the money to anyone in the queue (as Thatcher did in the UK in the early 1980s). Or maybe they will use the old clientelist and connections criteria, to gain political benefits — simply replicating the problem that Pasok more or less created in the early 1980s, but transferring it into the private sector! If we were to judge people by their linguistic abilities (or rather, lack thereof), we would be forced to conclude that most of the people who write on this and other blogs are in fact one and the same person – one characterized by a shockingly bad level of education. All this to say that contrary to your belief, another_greekboy ≠ Phoevos. I’ll answer some of the points raised later since I have other things to do at the moment. Public sector employment reform does require careful analysis. Money-wise you save paying salaries, so you lose their tax revenue but you must compensate them over several years. But the sociological impact is worse. As you imply, the immediate results of sackings without a short-term plan would hit families hardest of all: thus compensation is essential to ‘tide over’ until the economy, long-term, picks them up again, I would hope, into either useful public jobs or within a rejuvinated private sector. Your idea that Troika money could be used to facilitate sackings, with proper assessment of fairness is good. It would be a step towards a future redeployment of labour. There should be provision for training in modern methods and an attitude boost in the right direction. Resistance is a Greek habit unfortunately, but the generation now in their late teens, shocked into a new way of thinking, does give me hope. Do push your ideas into the right minds! I didn’t think that you were Phoevos, so I’m glad to have your assurance. When you have time, just explain, briefly, how you assess my level of education. I am interested also to find out how, because I’m interested in Islamic architecture and art, I’ve been classified as an admirer of the religion. I looked for some good in Islam and the art, (in household objects, ceramics, metal ware, glass, mosaic, books and ‘miniature’ painting), all traced back to Byzantine in the west and Sassanian artifacts in the east, is all that I have found to admire. I am profoundly sorry for the many people born into this despotic religion, who wish to renounce it at risk of their lives.Go to the Islamic Benaki to see the collection. Are the Benaki family Muslims? No. (Indus) , through the Rigvedas, the Maurian, Kushan, the Buddhists, Ashoka, the Hindu multiple gods, Mughal Emperors, Jesuits in Goa, Jews in Kerala and let us not forget the British, even Doxiadis in Islamabad, (earlier Alexander the Great) etc etc….then modern art and temple architecture through the ages, make me an admirer of the Hindu, Jain, Buddhist or Muslim religions? Neither am I a Roman Catholic or Jewish. I simply can not fathom the closed mind which labels me as an admirer of Islam! I apologise Greek boy, but there is nowhere that I can otherwise express my astonishment at an inexplicable attitude. Phoevos is clearly intelligent which makes his behavoir a source of concern, for his own mental state. I justify bothering you, with my excuse that most blogs get wildly off the subject. Perhaps someone reading this can respond and make sense of the situation exposed here and in Ekathimerini. Why do you assume that a hypothetical general reflection (“IF we were to judge people by their linguistic abilities […] people who write on this and other blogs are in fact one and the same person – one characterized by a shockingly bad level of education”) about the fact we shouldn’t try to “figure out” who is who on the basis of a so-called “linguistic style” is directed at you? As far as the rest of your comment, I confess I’m not sure what you are trying to say or what that has to do with what I posted. If you have issues with Phoevos (as I am surmising you do), you should take them up with him. I have never labeled people on the basis of their racial or religious affiliations. I have been however ticked off that people have tried to do that with me and others, perniciously implying that because we were not living in Greece (which may or may not be the case for me – that is no one’s concern except mine), we neither understood the situation in Greece nor really had the right to be commenting on what was happening there. If there is one thing I don’t suffer gladly, it is overbearing fools who are full of their own self-importance. I apologise unreservedly, in abject shame. BUT, you did indicate that Xenos was mistaken in suggesting that you were Dean ( Pheovos). Also you made a comment, a generalisation really, about levels of education of bloggers. I would not do that. Neither would I use lies (and here I am not meaning you, Greek boy) and lewd suggestions in order to intimidate me, in an attempt to discredit me, with whom he does not agree. As a person who has never in my long life come across such, I can only say, weird attitudes and opinions, as produced by Dean, in personal attacks other bloggers, I was very curious to know just how such ideas got into his head. However not a clue. Please forgive me..
My point was that if we think we can deduce that person “x” is person “y” based solely on linguistic style should we then conclude, using the same logic, that all the people who have appalling style in English one and the same person? Once again, if you have issues with Phoevos, please take them up with him. Firstly Guest are you blogging on Kathimerini under this name but without the Xenos, because there are remarks there insulting all of us. What is happening on these sites, suddenly Phoevos is Guest? another Greek Boy is extremely rude if not Dean then for sure he has the same DNA. Has Kathimerini suddenly become a far left wing newspaper, have they been threatened, others are complaining that SKy is covering all quarters. This isn’t reporting await your reply Guest this is very very odd. Ann, I don’t think that Guest(Xenos) is Dean, perhaps I’ve missed something though. [But a ‘Guest’ now blogging on ekathimerini IS Dean, definitely]. If I am wrong and they are the same person then without doubt there is a split personality involved, (Constantine== Dean==Phoevos==Guest), and a need for serious professional psychological, even psychiatric attention. Did I miss the memo? As the blogosphere of eKathimerini suddenly become your own ideological bailiwick giving you the right to decide what is or isn’t an acceptable comment? Must we now all abide by far right-wing dictates and live in the fantasy world of right-wing “common sense”? Good idea, Ann. Especially as we’ve been described on ekathimerini as a lot of old (can’t remember the word but it was surely not complimentary) with nothing to do. Responsible people who blog should be able to judge for themselves if their own comments are acceptable. If they make mistakes, then apologies are in order, with a determination to desist in the future. For you or I, or anyone else to be watch-dog and judge of free speech, free expression and behaviour online would not be necessary in decent society. I do not post on eKathimerini. I always try to post either as Guest(xenos) or under my real British name. Ann: you should be able to discern different linguistic styles (and I am not referring to level of education at all). My own judgement on this issue is given above; I have plenty of experience in ascertaining the original authors of text, with a high level of accuracy. Rosemary somebody has definitely lost the plot here, I give up, far too childish. My Daughter has just told me to read ‘The Garden of Evening Mists’ and a friend told me last month it was a very good read. Ann, my comment has moved above. Checking to see if I was banned too. At least 3 people I know have been permanently banned. Censorship is by far the cardinal sin. So this is a test. Don’t bite. I think that as an immigration expert you should migrate to eKatimerini blogs where a wholesale slaughter is taking place in terms of freedom of expression. Just a thought. I saw here that my name has been used in vein and I wanted to inject some reality as to the ekathimerini allegations made. Based on internet averages, ekathimerini.com is visited more frequently by males who are over 65 years old, are graduate school educated and browse this site from home. Therefore this is not my age group. Furthermore only about 16% or so is the total Greek ekathimerini audience (which means that its Greek blogging % is much less because Greeks would prefer to write in Greek rather than English), the rest is all foreign bloggers (click on the tab Audience to see the country breakdown). You will also notice that ekathimerini has suffered an almost 50% traffic drop (click on Traffic stats ) and it’s back to its normal range. Therefore ekathimerini seems an unlikely place to blog because a) its audience composition b) predominent age group c.) not a particularly influential place and finally from your comments d) a place of censorship. Thank you for the opportunity to clarify these broad theme issues. I hope this is my last posting here. I have subsidized this blog for more than 1.5 years and it’s time for it to find its own sea legs. Thanks to Nick for the opportunity and thanks to all of your for participation. Bye now.